Cruise Control at Sea. The SP-80 takes the helm and sets you free. For boaters who know where they're going. SP-80 takes you where you want to be--effortlessly. It's smart, precise piloting gives you the extra hand on deck you've always needed. And the operation is a snap: Simply set the course and the SP-80 takes the controls, piloting you to your destination with ease and precision. So bait the lines or simply enjoy the sunset. With the SI-TEX SP-80 Autopilot you're right on course. Hands free, and ready to really let you go. Designed for inboard, outboard and sterndrive vessels with either hydraulic or quadrant steering systems. Automatically pilots to your next waypoint using built-in NMEA 0183 Loran/GPS interface. Waterproof control head easily installs flush or surface mounted. 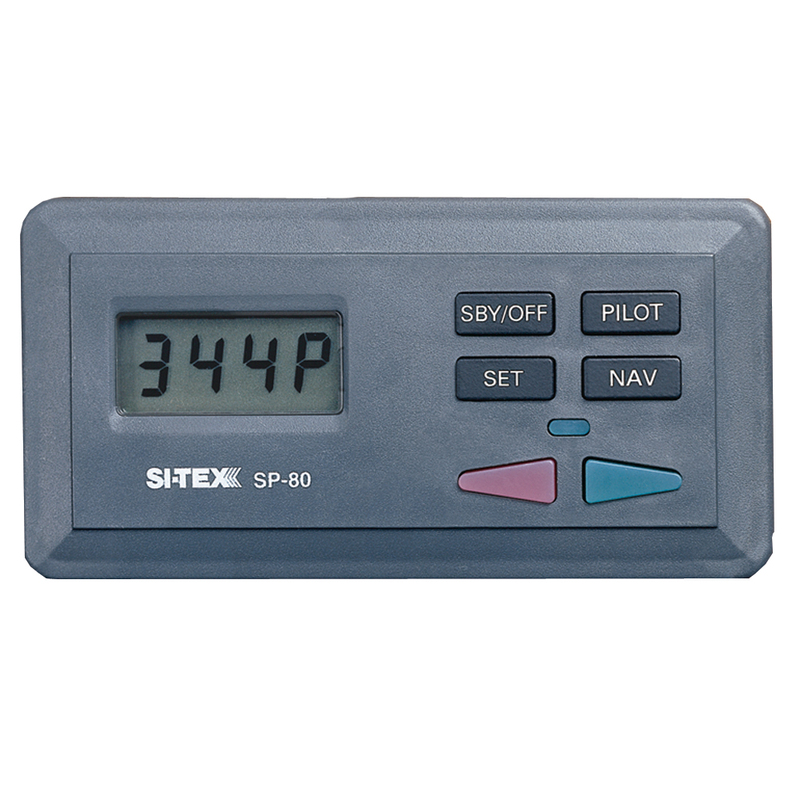 System can be expanded by adding fully functional second-station option with the SI-TEX SP-70 Handheld Control Unit. Bold, backlit display with ten levels of brightness for clear reading in any light. Accurate digital displays of rudder angle and operating mode in use, constantly giving you up-to-the minute operating status. Automatic Sea State and Trim controls and ten selectable levels of rudder sensitivity with high and low speed settings for smooth, precise steering. Rudder feedback verifies autopilot's commands. Ghost Rudder backup allows autopilot to use memory of rudder movements to calculate new movements in event of rudder feedback failure. Heading Output feature allows you to stabilize radar display. Built-in diagnostics and self tests, plus visual and audible alarms. Power Steering mode offers convenient push-button steering. Stand-By mode for manual steering situations. Optional analog Rudder Angle Indicator for easy, at-a-glance reading of exact rudder position. Works with solenoid valves also.